Possibly a childhood friend of SS chief Heinrich Himmler, SS-Gruppenführer Dr. Karl Franz Gebhardt was born in Haag/Upper Bavaria on November 23, 1897. He was wounded in action and the winner of the Iron Cross 1st Class, while assigned to the 4th Bavarian Infantry Regiment, in World War I; he was also a British prisoner of war for a short time. He later graduated the University of Munich as a physician. In 1923, he was a member of the Freikorps/Bund Oberland and participated in the Beer Hall Putsch. He joined the Nazi Party and SS in 1933. In 1937, he became chair holder for orthopedic surgery at the University of Berlin. 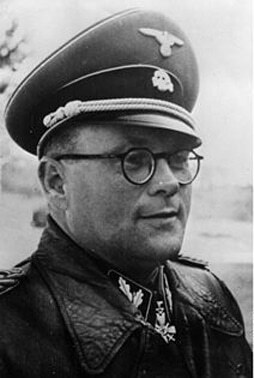 Gebhardt subsequently a personal physician to Heinrich Himmler. His other titles included Chief Surgeon to the Reich Physician to the SS and Police, President of the German Red Cross. In 1940, Dr. Gebhardt served a tour of duty in the 2nd SS Division Das Reich. On May 27, 1942, Himmler sent Dr. Gebhardt to Prague to assist Reinhard Heydrich, who had been gravely wounded in an assassination attempt. Gebhardt disdained the use of sulfonamide, expecting Heydrich to make a full recovery without antibiotic use (which Gebhardt thought worthless). Heydrich died of sepsis.